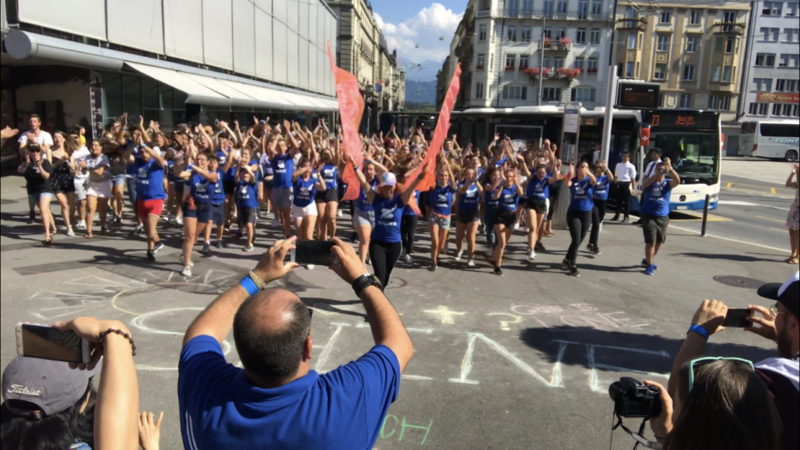 Students performing in a dance flash mob in Lucerne drawing a crowd to hear about Jesus. Given that the Swiss are a very task-driven and time-oriented people, we were told by the nationals that it would be very difficult to find people who’d be willing to stop and talk much. 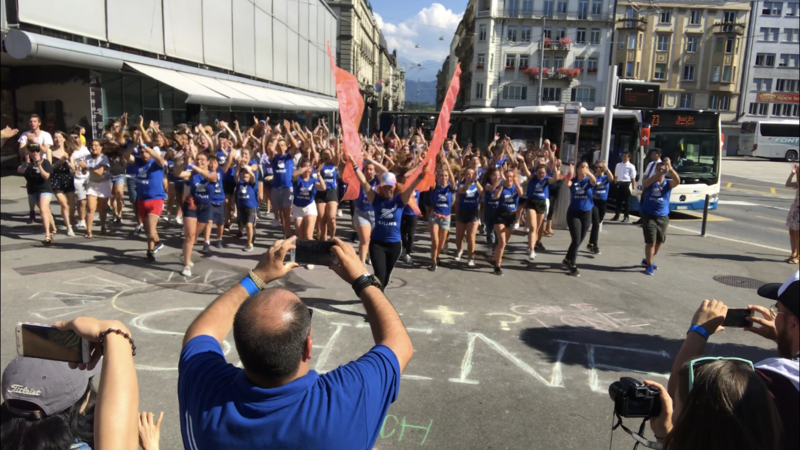 Students from all over western Europe (and Mandi) prepared amazing performances for the city center of Lucerne, and crowds gathered quickly to watch these energetic teens. But as rapidly as crowds came, they left. Not many seemed to have the time to engage in any conversation. But the Lord still had set divine appointments. One of my Portuguese friends got to see another young man come to Christ. Lots of passers-by received invitations for a party at a local beach park, where they could enjoy free food, drinks, a live band and of course, hear the gospel. The Swiss staff also came up with various creative ways to help us all sow seeds of the gospel around the cities of Lucerne and Sursee that took people by surprise. For example, Swiss francs were provided to SHINE participants so that they could randomly bless people in local stores and cafes by paying a person’s bill. Tim, Danny, and Hannah (another teen we brought from the USA) bought one woman’s coffee. She was delighted to be given this unexpected gift and was curious why they would do such a thing for a stranger. They handed her a business card that read, “Paid In Full” and told her to check out the website (which shares how Jesus paid it all for us). Another woman watching from nearby came up to them and said, “A young man just paid for my drink as well. I was so overwhelmed by his kindness, that I didn’t even know what to say. Why are you doing this?” This time, Tim shared about how the teens were tangibly showing the love of God. The woman was so touched by the gesture, that she was all ears when Hannah shared a short and sweet gospel message using an evangelistic tool called “The Four”. They were also able to thank the other young man on her behalf and let him know that God had used him to make an impact on the woman even though it wasn’t evident from the initial response he got. To see some amazing footage from SummerSHINE, check out this short video by clicking here.